This weekend marked a large milestone for our younger daughter: I taught her how to cut the grass! We as a blended family believe that it’s important for our girls to learn to be self-sufficient, and as a result we work to teach them skills they will need when they live on their own: cooking, cleaning, yard work, study habits, responsibility, etc. And this weekend that meant it was time for our Lou to cut the grass. It was after she finished the yard that I saw the parallel with blended family life. In learning to cut the grass, the single most important thing to remember is that, if you work at it, it will get easier with time. 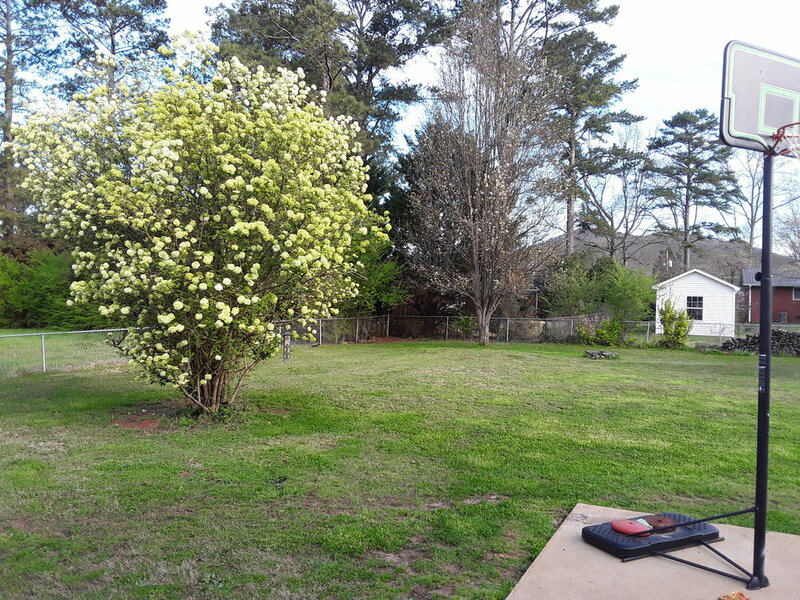 Between the grass Lou cut and our snowball bush, our yard is looking ready for spring! In our blended family world (as well as in the blended lives of many of our friends), we have seen this to be true, and so I wanted to share this bit of encouragement with you this morning. Praise be to God for how well things are going in our world! And, for those of you struggling in your blended family situation, I’d like to share just a couple of major points about how we got here. First, understand that any blended situation is going to take time before it can become comfortable and routine. Our lives were not always this way, and without a doubt situations will arise in the future that will test our patience. However, I can state that where we are now is miles from where we have been in the past. It has taken us a few years to get the hang of things like good communication, proper respect for distance and boundaries, and how to balance our desires with that of the other household. And if I’m being entirely honest, we still get it wrong sometimes. But in general, our blended family world is on an upward trajectory, and much of that is the result of patience from all involved. Soon it’ll be time to eat on the patio again, enjoying the view and the smell of the grass! Second, in order to work well together, we all have to consciously choose to put in the work. It’s not always easy, nor is it always fun (much like cutting the grass! ), but when you do the work the results are almost always positive. Hold your tongue when you want to respond harshly or with sarcasm, pray for the other household when you want to criticize, and show respect even when you strongly disagree. These type of actions are good not just because they build better relationships but also because they are the right thing to do: that is, you don’t just do them because they are good for the family, you do them because by doing these things you are allowing God to change your heart as well. I am thankful to say that I have seen God continue to work in my heart year after year, and He does the most work when I get my own ego out of the way and simply try do to the right thing even when it’s hard. So that’s my encouragement to you today: do the right thing, even when it’s hard. And then, especially when everyone is putting in the time and the work, you’ll begin to see a difference in your own heart and in the hearts of those around you. Action Step: This week, choose to show patience and respect even when you’d rather not. Make this a habit and enjoy the results!